For a great cruise down the outside of Hook and Whitsunday Island. Go past magnificent Hill Inlet, see the view up to Whitsunday Peak and then - be astounded by the sight of 7 kilometres of pure white sand. Map c26 100 Magic Miles Whitehaven Beach is the epitome of the Whitsundays. Totally natural, award winning beach completely un spoilt and picture perfect, it really does have to be seen to be believed!!! Anchor at the southern end and either dinghy or swim ashore and just stroll along this natural wonderland. There’s a great shady bush walk to Chance bay in the south and a shorter Solway circuit that takes in views over the southern bays and islands, Pentecost and Lindeman. Whitehaven Beach sand is unlike any other, its pristine silica white sand, very fine and great for exfoliating or cleaning your jewelery. The many day boats will leave after lunch and you with a few other bareboats, charter boats and a hand full of campers will have the whole beach to enjoy. 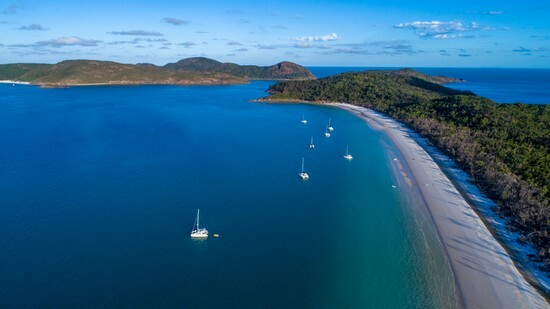 You may also slip around to Tongue Bay for a more comfortable overnight anchorage or you may be able to pick up mooring best in Southerly conditions. Whitehaven Beach is renokowned for its pure white sand and its beautiful scenery. The sand consists of 98% pure silica which gives it a bright white color. Local rocks do not contain silica, geologists suggest the sands were brought to the beach via prevailing ocean currents over millions of years. The Whitsundays lay in a geologically active zone, where volcanic activity continued for 37 million years. Explosive eruptions threw rock and ash into the air to rain down on the surrounding land. Layers of volcanic debris built up and gradually formed a solid bedrock. Today, this bedrock, composed of ash and rock fragments 'welded' together, can still be seen on Whitsunday and Hook islands. This hardened rock appears as a smooth greenish grey to brown, and is worn away by saltwater wave action. Tip ...Bring a lightweight esky bag to the beach with you so you have somewhere cool to keep your drinks. Whitehaven has very little shade protection so slap on a hat, slip on a shirt and slop on the sunscreen! Beware of seagulls steeling food! Please do not feed the gulls.